the particle has been found. 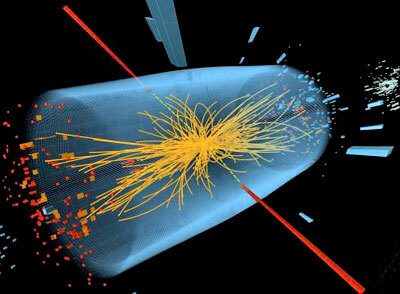 Higgs boson particle has been found. that make up atoms their mass. on proof of Higgs boson. Scientists at CERN will announce that the elusive Higgs boson 'God Particle' has been found at a press conference next week, it is believed. Five leading theoretical physicists have been invited to the event on Wednesday - sparking speculation that the particle has been discovered. 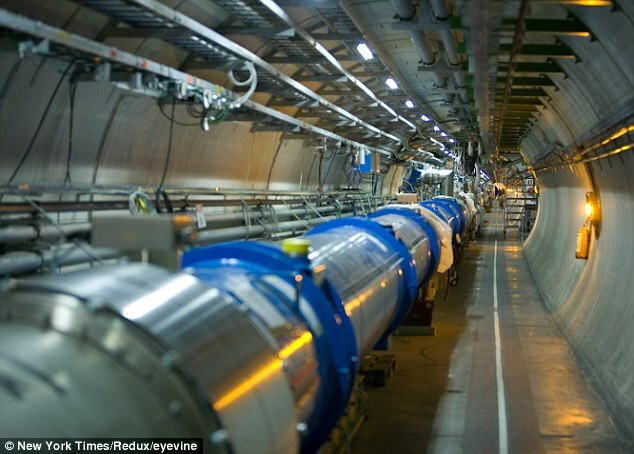 Scientists at the Large Hadron Collider are expected to say they are 99.99 per cent certain it has been found - which is known as 'four sigma' level. 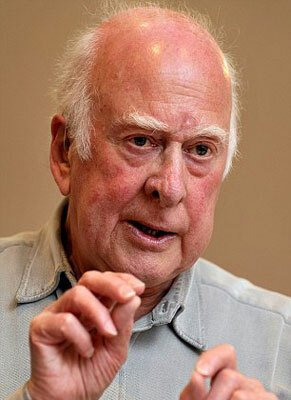 Peter Higgs, the Edinburgh University emeritus professor of physics that the particle is named after, is among those who have been called to the press conference in Switzerland. The management at Cern want the two teams of scientists to reach the 'five sigma' level of certainty with their results - so they are 99.99995 per cent sure - such is the significance of the results. Tom Kibble, 79, the emeritus professor of physics at Imperial College London, has also been invited but is unable to attend. The Higgs boson is regarded as the key to understanding the universe. Physicists say its job is to give the particles that make up atoms their mass. Without this mass, these particles would zip though the cosmos at the speed of light, unable to bind together to form the atoms that make up everything in the universe, from planets to people. The collider, housed in an 18-mile tunnel buried deep underground near the French-Swiss border, smashes beams of protons - sub-atomic particles - together at close to the speed of light, recreating the conditions that existed a fraction of a second after the Big Bang. If the physicists’ theory is correct, a few Higgs bosons should be created in every trillion collisions, before rapidly decaying. This decay would leave behind a ‘footprint’ that would show up as a bump in their graphs. However, despite 1,600 trillion collisions being created in the tunnel - there have been fewer than 300 potential Higgs particles. Now it is thought that two separate teams of scientists, who run independent experiments in secret from each other, have both uncovered evidence of the particle. However, the two groups, CMS and ATLAS, are expected to stop short of confirming its existence. 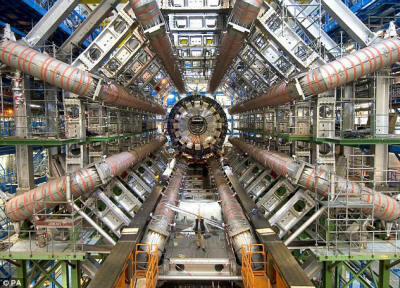 Physicists at a U.S. laboratory say are also close to proving the existence of the Higgs boson. The announcement by the Fermi National Accelerator Lab outside Chicago came two days before physicists at CERN are set to unveil their own findings in the Higgs hunt. The Fermilab scientists found hints of the Higgs in the debris from trillions of collisions between beams of protons and anti-protons over 10 years at the lab's now-shuttered Tevatron accelerator. But the evidence still fell short of the scientific threshold for proof of the discovery of the particle, they said, in that the same collision debris hinting at the existence of the Higgs could also come from other subatomic particles. 'This is the best answer that is out there at the moment,' said physicist Rob Roser of Fermilab, which is run by the U.S. Department of Energy. Physicists not connected to Fermilab expressed cautious optimism that the long-sought particle had finally been found. 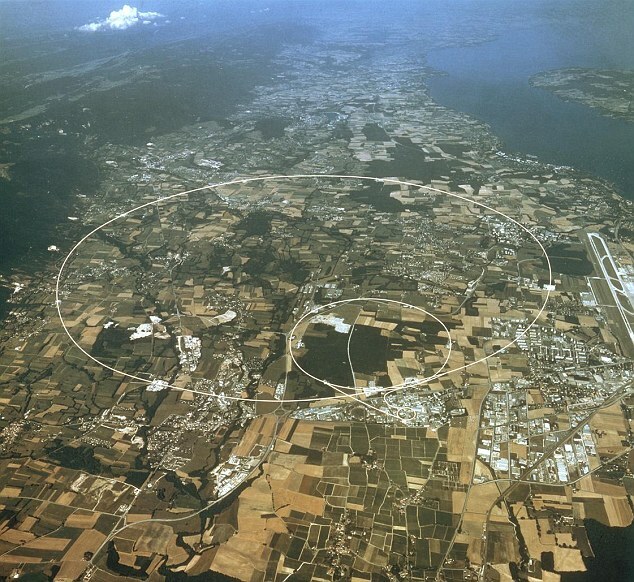 'These intriguing hints from the Tevatron appear to support the results from the LHC shown at CERN in December,' said Dan Tovey, professor of particle physics at the University of Sheffield in Britain. 'The results are particularly important because they use a completely different and complementary way of searching for the Higgs boson. This gives us more confidence that what we are seeing is really evidence of new physics rather than just a statistical fluke,' Tovey added. Tovey said scientists will have to wait until Wednesday for the latest results from the European scientists before 'getting the full picture' concerning the Higgs boson. The Higgs particle erupting from the collision of protons. 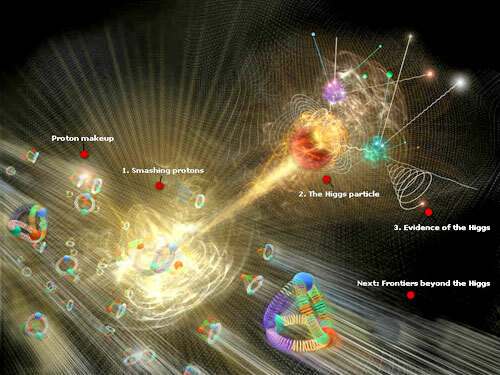 In an artist's conception, a Higgs boson erupts from a collision of protons. Speaking to a packed audience Wednesday morning in Geneva, CERN director general Rolf Heuer confirmed that two separate teams working at the Large Hadron Collider (LHC) are more than 99 percent certain they've discovered the Higgs boson, aka the God particle - or at the least a brand-new particle exactly where they expected the Higgs to be. The long-sought particle may complete the standard model of physics by explaining why objects in our universe have mass - and in so doing, why galaxies, planets, and even humans have any right to exist. The two LHC teams searching for the Higgs - the other being the CMS (Compact Muon Solenoid) project - did so independently. Neither one knew what the other would present this morning. For example, though the teams are certain the new particle has the proper mass for the predicted Higgs boson, they still need to determine whether it behaves as the God particle is thought to behave - and therefore what its role in the creation and maintenance of the universe is. "I think we can all be proud... but it's a beginning," Heuer said. Evans had predicted Tuesday the teams would announce a four-sigma result - just short of the rigorous standard traditionally required for a new-particle observation to officially count as a true discovery and not a fluke. "a mixture of the LHC doing a fantastic job" and "ATLAS and CMS doing a fantastic job of improving their analysis since December," when the two teams announced a two-sigma observation of signs of a Higgs-like particle. ATLAS spokesperson Fabiola Gianotti also had high praise for the LHC, a multibillion-dollar machine that had suffered numerous mishaps and setbacks in its early days. Wednesday's announcement builds on results from last December, when the ATLAS and CMS teams said their data suggested that the Higgs boson has a mass of about 125 gigaelectron volts (GeV) - about 125 times the mass of a proton, a positively charged particle in an atom's nucleus. While that might seem impressive, it falls short of the stringent five-sigma level that high-energy physicists traditionally require for an official discovery. Five sigma means there's a less than one in a million probability that a finding is due to chance. The Higgs boson is one of the final puzzle pieces required for a complete understanding of the standard model of physics - the so-far successful theory that explains how fundamental particles interact with the elementary forces of nature. 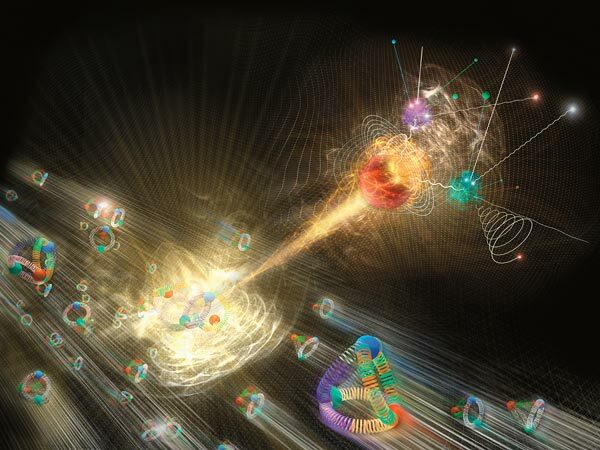 The so-called God particle was proposed in the 1960s by Peter Higgs to explain why some particles, such as quarks - building blocks of protons, among other things - and electrons have mass, while others, such as the light-carrying photon particle, do not. Higgs's idea was that the universe is bathed in an invisible field similar to a magnetic field. Every particle feels this field - now known as the Higgs field - but to varying degrees. "It would be very difficult to form atoms," Peskin said. "So our orderly world, where matter is made of atoms, and electrons form chemical bonds - we wouldn't have that if we did not have the Higgs field." Exotic fundamental particles - some of which likely haven't existed since the early moments after the big bang - are created in the high-energy crashes. But the odd particles hang around for only fractions of a second before decaying into other particles. Theory predicts that the Higgs boson's existence is too fleeting to be recorded by LHC instruments, but physicists think they can confirm its creation if they can spot the particles it decays into. they want nothing less than to crack the code of the physical universe. Now that the Higgs boson - or something like it - has been confirmed to indeed have a mass of around 125 to 126 GeV, scientists have a better idea why the God particle has avoided detection for so long. There are also lingering questions that will require years of follow-up work, such as what the God particle's "decay channels" are - that is, what particles the Higgs transforms into as it sheds energy. Something the public often forgets, too, is that ATLAS and CMS make up only two of the LHC's four major experiments, Evans said. The other two - the LHCb Collaboration and Evan's own ALICE - are investigating other physics arcana, such as why the universe contains so little antimatter. with the Higgs boson's predicted existence. Physicists welcomed July Fourth with intellectual fireworks, announcing "preliminary" results pointing to the discovery of the long-sought "God particle." Formally known as the Higgs boson, it was detected in experiments at the European Organization for Nuclear Research (CERN) lab near Geneva. Q: So what is a Higgs boson? A: A tiny subatomic particle that apparently weighs about 130 times as much as an atom of hydrogen, the lightest gas. A: Simply put, the Higgs particle interacts with other subatomic particles that are building blocks of atoms in a way that slows them down. It's the reason that matter in the universe has mass. Mass gives the particles inertia, or resistance to being moved faster. Q: What is a simple analogy that describes this effect? A: Compare Higgs bosons to groupies mobbing a celebrity. The other particles are the celebrities, desperately trying to move but slowed by autograph-seekers. Higgs bosons don't have pens, but the attention they give to the other particles slows them, creating inertia. Q: Why did physicists think this likely had to exist? A: Physicists look to particles to explain forces in the universe. In the physicists' theories, electromagnetic and nuclear forces don't need particles with mass to work. But the particles do have mass, so we need an explanation for why. In 1964, Peter Higgs of Scotland's University of Edinburgh and other physicists theorized the Higgs boson was the culprit. Q: How did they make this discovery? Essentially, two teams collected data in separate experiments that smashed together millions of subatomic particles called protons to see what pieces emerged from the smash-ups. The particle reported on Wednesday fell to pieces in ways predicted by Higgs and other physicists. Q: How sure are they that this is the Higgs boson? A: CERN chief Rolf Heuer calls it "a particle consistent with the Higgs boson." 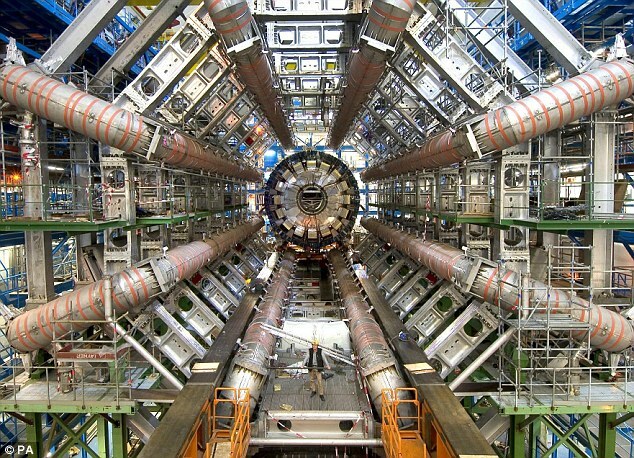 CERN assigned about a 0.000057% statistical chance of the particle detection being wrong.